Editor's Note: Joan is a biologist. She is also mother of two, one of whom is an 11-year survivor of alveolar rhabdomyosarcoma. Joan is an active volunteer for a variety of childhood cancer and sarcoma organizations and spends much of her spare time as Co-List manager of the ACOR Rhabdo-Kids mailing list, as a Patient Advocate for the Children's Oncology Group, and as a board member of the Sarcoma Alliance. This article was inspired by several on-line postings that raised questions about the frequency of childhood cancers or sarcomas. In almost all of these postings, people seemed to understand the annual risk of developing a cancer but did not understand the cumulative risk over a lifetime. This article thus is an effort to view sarcoma statistics in a different way than they are usually presented, and possibly stimulate others to look into the interesting but not always intuitive field of cancer statistics and their uses. What is the incidence of sarcoma? Everyone who has had experience with sarcoma knows that it is an uncommon type of cancer. For example, when my daughter Ali was diagnosed with rhabdomyosarcoma (rhabdo), the most common type of pediatric soft tissue sarcoma, we were told that the odds of getting this cancer were approximately six in a million. This number is supported by the NCI SEER statistics. Table 1 shows that among children under the age of 20, on average about five children out of every 1,000,000 will be diagnosed with rhabdo each year. Add in about half of the "unspecified" cases, and that agrees closely with the six in a million incidence. Certainly it is not a common disease. The Surveillance, Epidemiology, and End Results (SEER) Program of the National Cancer Institute (NCI) is an authoritative source of information on cancer incidence and survival in the United States. SEER currently collects and publishes cancer incidence and survival data from population-based cancer registries covering a portion of the US population. Most of the statistics in this article are from NCI SEER reports. Click here to access the SEER glossary of statistical terms. Click here to access definitions of cancer terms by the NCI. All websites referenced in this article were accessed during the first two weeks of October, 2007. Rates are per 1,000,000 and are age-adjusted to the 2000 US Std Population. Source: National Cancer Institute, SEER Cancer Statistics Review, 1975-2004, Adapted from Table XXIX-1. For Kaposi's sarcoma, the number of cases was too low to calculate an incidence rate. Sarcomas are not common among any age group. In adults, sarcomas are estimated to be about one percent of all cancers, and approximately 12,000 people a year in the U.S. are diagnosed with sarcoma (NCI, Report of the Sarcoma Progress Review Group, Jan. 2004, page 1). Sarcomas are relatively more common among children. Between 1,500 and 1,700 U.S. children are diagnosed with a bone or soft tissue sarcoma each year making up about 15 percent of cancers in children under the age of 20 (ibid), but pediatric cancers themselves are rare and make up only about 1 percent of cancer cases (SEER Cancer Statistics Review 1975-2004, Table I-10 Age Distribution at Diagnosis and Death). Table 2 shows that the estimated number of new bone and soft tissue cancers (most comparable to sarcomas according to the way that adult cancers are classified) in the U.S. in 2006 was 12,290, approximately 1 percent of all cancers. Source: National Cancer Institute, SEER Cancer Statistics Review, 1975-2003, From Table I-1. Eur J Cancer. 2006 Sep;42(13):2136-49 Childhood soft tissue sarcomas incidence and survival in European children (1978-1997): report from the Automated Childhood Cancer Information System project. Pastore G, Peris-Bonet R, Carli M, Martínez-García C, Sánchez de Toledo J, Steliarova-Foucher E.
Verdecchia A, Francisci S, Brenner H, Gatta G, Micheli A, Mangone L, Kunkler I; EUROCARE-4 Working Group. Recent cancer survival in Europe: a 2000-02 period analysis of EUROCARE-4 data. Lancet Oncol. 2007 Sep;8(9):784-96. Numbers such as "six in a million" are difficult for many people to understand, however. A number like this may make it seem as though only a minutely small number of families in the country are grappling with some stage of the rhabdo experience. It might be more understandable to many if incidence statistics were presented in a different way. How Many People in the United States Have Sarcoma? The incidence of many cancers is given as a lifetime risk. An oft-quoted fact about prostate cancer is that one of every 6 men will develop it sometime during their lifetime. In the same vein, one out of every 8 women will develop breast cancer during their lifetimes. It is very difficult to find comparable lifetime risks for developing sarcomas. The 1,700 children or 12,000 total numbers of sarcoma cases, and the six in a million for rhabdomyosarcoma, all represent the risk for a single year. However, representing the risk over a lifetime rather than a single year provides two benefits in understanding the incidence of a cancer. First, it represents the actual odds of a person developing that cancer at some time during their life. Second and perhaps as importantly, it makes the risk easier to understand. The lifetime risk is cumulative; that is, the risk of being diagnosed with a cancer in one year is added to the risk of being diagnosed in the next year, and so on. For example, each year the odds of a child getting rhabdo are about six in a million. Multiply that by the 20 years of "childhood" and the odds of a child getting rhabdo are about 120 in a million, or just about one in 8,500. And since rhabdo makes up a little more than one-quarter of pediatric sarcomas, about 1 in 2,300 children under the age of 20 in the U.S. will be diagnosed with a sarcoma. These numbers represent the risk of a child being diagnosed with sarcoma by the age of 20 – 1 child in 8,500 for rhabdo, and 1 child in 2,300 for all sarcomas. These numbers also bring the risk into a scale that is easier to understand, as people can relate more to risks expressed in hundreds or thousands rather than those expressed in millions. The same cumulative principle holds true for adult sarcomas. There are about 12,000 new cases of sarcoma annually and approximately 300 million people in the U.S., thus the odds of getting a sarcoma can be given as about 40 in a million for any one year. Although the risk of developing a sarcoma as an adult actually varies somewhat from year to year, as a very rough estimate of lifetime risk the yearly risk can be assumed to be the same every year (see "A Double Check"). Multiply the annual risk by, say, 70 years of lifespan, and the odds of being diagnosed with sarcoma are 2,800 in a million, or about one in every 350 people. A Double Check: The best way to determine lifetime risk would be to use an age-adjusted formula. Unfortunately, SEER provides lifetime risks for other cancer types but not sarcomas. The number of 1 in 350 is therefore a very rough approximation, but I believe it is a reasonable and conservative estimate. In order to check if this figure is approximately correct, I made two other quick calculations. SEER states that the lifetime risk for developing any cancer is 40 percent. Thus, 4 out of every 10 people will develop cancer sometime in their lives. If sarcomas are one percent of cancers, then the lifetime risk of developing a sarcoma is 0.4 percent, or 4 in 1000, or 1 in 250. One in 2,300 children will develop sarcomas, and pediatric sarcomas make up about 15 percent of all cases. Using this number, about 1 in 340 people will develop sarcomas during their lifetime. "When" counts as much as "How Many"
There is another important sarcoma statistic that underscores the impact on society rather than considering the number of cases. That statistic is the age at which sarcomas are diagnosed. Cancers that affect younger people have disproportionately large impacts, because the younger the victim, the more potential there is to contribute to society. For example, despite the relatively small number of cases of childhood cancer, an extremely large number of years of life are lost if a child does not survive. The graphs below from SEER demonstrate this effect. The left graph in Figure 1 below illustrates that despite the rarity of childhood cancer, 105,200 person-years of life are lost each year to childhood cancer, just for children up to the age of 14. The right graph in Figure 1 shows that for each child who does not survive cancer, 70 years of life are lost on average. Compare this to the 9 years lost on average for prostate cancer, or the 19 years for breast cancer. It is a loss to society when anyone’s life is cut short, but the death of a child from cancer results in an incomparably larger loss of the potential to contribute to society. Similar statistics for adult sarcomas are difficult to find since most adult cancer statistics are given by site of cancer and not by type of cancer. As a result, sarcomas are not grouped in an easy way to analyze, but it is very likely that if adult sarcomas were broken out separately, they would also show a disproportionately large loss of person-years. The reason is that unlike many other cancers sarcoma is a disease of young and old alike. The NCI SEER project has compiled data that show the risk for developing cancer at a specific age. The SEER data indicates that a third of soft tissue cancers (again, not exactly the same as but most comparable to soft tissue sarcomas) and over half of bone sarcomas are diagnosed in people under 45 years of age. In comparison, less than one-tenth of all cancers occur in this age group (Table 3). Furthermore, the table shows that nearly half (45 percent) of bone sarcomas and over a fifth (21 percent) of soft tissue cancers are diagnosed in people under the age of 35, compared to less than 4 percent of all cancers. For four of the most common types of cancer, 0 percent of prostate cancers, less than 1 percent of lung cancers, 1 percent of colon cancers, and 2 percent of breast cancers are diagnosed in people less than 35. Note that it is not clear whether the SEER information for soft tissue cancers includes Kaposi’s sarcoma, which is a disease mostly in relatively young men with AIDS, and a disease that has declined dramatically in recent years due to better HIV treatments. If Kaposi’s is included, then the average age of diagnosis for soft tissue cancers may increase in coming years. Source: National Cancer Institute, SEER Cancer Statistics Review, 1975-2004, Table I-10. Incidence of sarcomas in young people unfortunately is paralleled by deaths from sarcomas. As can be seen in Table 4, over a third (36 percent) of deaths from bone cancers and about a fifth (19 percent) of deaths from soft tissue cancers occur in people under the age of 45, compared to less than 5 percent of deaths from cancers overall. Source: National Cancer Institute, SEER Cancer Statistics Review, 1975-2004, Table I-12. Assuming that most of the bone and soft tissue cancers are sarcomas, it appears that the average age of a patient diagnosed especially with a sarcoma, particularly a bone sarcoma, is considerably younger than the age of most cancer diagnoses. The young age at which many sarcomas are diagnosed has important implications. The younger the age of diagnosis, the more years of worry about relapse or dealing with side effects of treatment. A bone sarcoma survivor diagnosed at the median age of 39 has thirty-eight more years of life to look forward to, if they live to the average U.S. lifespan of 77 years. A colon cancer survivor diagnosed at the median age of 71 would have six more years of life, on average. Thus, research that improves sarcoma survival has a disproportionately large result if success is measured in the average number of years of life saved. Another way of measuring this impact on society is Cancer Prevalence, which is the number of people alive a certain number of years after diagnosis. SEER provides limited data for bone and soft tissue cancers, estimating that 107,000 people in the U.S. are alive who have been diagnosed within the last 28 years (see SEER US Estimated Prevalence Counts on 1/1/2004 Bones and Joints Cancer and Soft Tissue including Heart Cancer). Unfortunately for these cancers SEER does not provide data for complete prevalence, in other words all the people alive after a diagnosis no matter when the diagnosis was made. Survivor health issues are particularly true of children with sarcomas who required multi-modal therapy including relatively high doses of chemotherapy and radiation. The Children’s Oncology Group has developed the Long-Term Follow-Up Guidelines for Survivors of Childhood, Adolescent, and Young Adult Cancers for this very reason. Survivors of sarcomas must deal with late effects of treatment for the many years ahead of them. As a result, the cost to the individual and society for adequate health care will be much greater for the younger cancer survivor. Clearly, the young age of sarcoma patients argues strongly for developing treatments that leave sarcoma survivors undamaged for the many years of life ahead of them. Research that increases survival statistics for sarcomas may not make a blip in the overall cancer survival statistics, if survival is measured in terms of number of people saved, but will make a disproportionately large improvement if survival is measured in terms of number of person-years of life saved and years of life saved per person. Young people diagnosed with cancer are usually relatively healthy otherwise, and do not have a lot of other diseases that can complicate clinical trials for new treatments. They should be prime candidates for inclusion into clinical trials (see There is no reason to include age as an entry criterion for any clinical trial). Survival Statistics are also Important Pediatric sarcomas have a lower survival rate than childhood cancer overall. Table 5 summarizes relative five-year survival rates of pediatric sarcomas for the period 1996-2003. The average five-year survival rate for pediatric cancers is 78 percent, but for sarcomas it is considerably less. 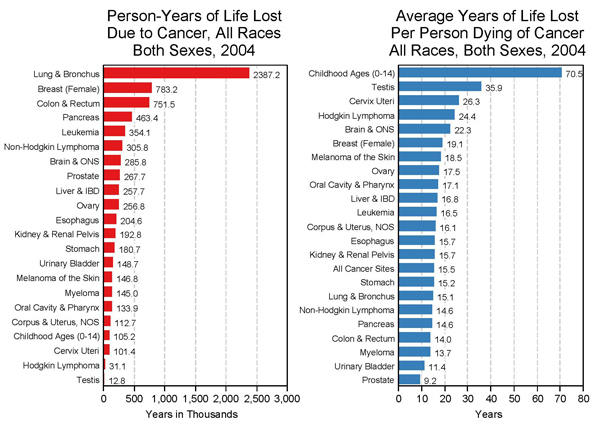 Source: NCI, SEER Cancer Statistics Review, 1975-2004, Adapted from Table XXIX-6. Please note that these statistics lump many risk factors and do not reflect newer treatments; thus, they should not be used to assess an individual’s survival potential. One possible reason for lower survival rates is the fact that many sarcomas are diagnosed in adolescents and young adults in ages that fall into what has been termed the "teen gap" in treatment success (see Adolescent and Young Adult Cancer Care). The advances in cancer treatment for children and adults have not been matched for adolescents and young adults. There are several possible causes for this, including increased delay in diagnosis and lack of insurance, but one reason may be that this age group has different disease characteristics and in the past has had low enrollment in clinical trials, limiting the opportunity to improve treatments. In the past few years however there has been a concerted effort to include this group in clinical trials. 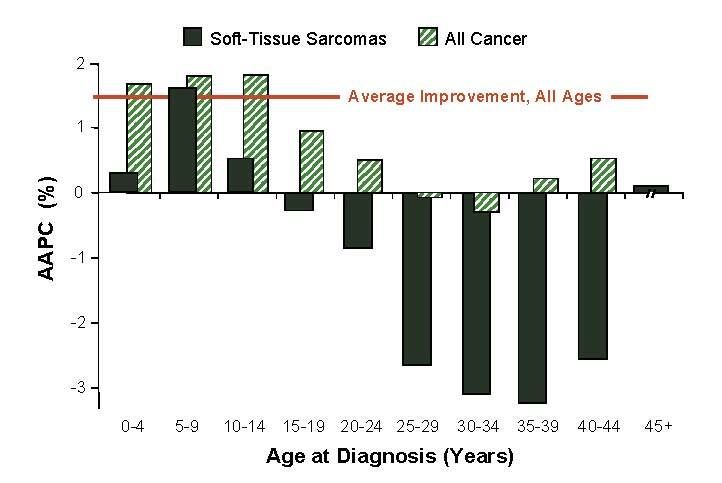 The following figure shows the average annual percent change in survival from 1975 to 1997 for all cancers and soft tissue sarcomas by age at diagnosis. The survival rate appears to have declined for all groups from age 15 through 44, while increasing for younger and older groups. The SEER survival data for adult sarcomas does not show the same survival shortfall. In fact, survival seems to be slightly higher than for all cancers (Table 6). Some of this might be due to the younger age and healthier condition of sarcoma survivors, but there is another possible interpretation for these results. Source: National Cancer Institute, SEER Cancer Statistics Review, 1975-2004, Adapted from Table I-4. The "relative survival rate" data presented in the SEER survival tables looks at the chance of dying of cancer relative to other causes of death. People who are alive but still fighting cancer are considered as survivors in the above tables. This might be particularly significant for some subtypes of adult sarcomas which are low-grade and relatively slow growing. These sarcomas could be considered the equivalent of a chronic disease (somewhat like chronic leukemias, more typical in adults, versus acute leukemias, more common in children), and some may still be fighting the disease five years and more from diagnosis. The NCI published on September 17, 2007 a new SEER Survival Monograph: Cancer Survival Among Adults: US SEER Program, 1988-2001, Patient and Tumor Characteristics. Chapter 11 discusses survival rates for adults with all sarcomas except bone sarcomas. Table 7 presents the 5-year and 10-year relative survival rates for different stages and histologies of sarcoma, for adults (20 years and over) for the period from 1988 to 2001. [Legend: — Statistic not displayed due to less than 25 cases and * Not enough intervals to produce rate.] Source Cancer Survival Among Adults: US SEER Program, 1988-2001, Patient and Tumor Characteristics, Sarcomas, Chapter 11, Table 11.6, page 4. The data in Table 7 includes patients treated up to 20 years ago, and thus it is likely that over time the survival rates have increased. However, this table indicates that relative survival rates continue to decline from 5 to 10 years, indicating that many 5-year survivors may not be cancer-free. The numbers in the "% Change" column appear to show that the soft tissue cancers, have experienced a 20 percent increase in mortality over this 30-year period. But the numbers in the "Annual % Change" (APC) column tell a different story – the annual decline for soft tissue cancers averages 1.2 percent a year. Clearly, the mortality rate for soft tissue cancers could not both have gone up and down during the same time period. The explanation is that % Change is calculated by comparing mortality in the first two years of the time period to mortality in the last two years. APC is calculated differently, by fitting all the mortality data to a line and determining the slope of the line. This unusual result might have occurred because the % Change analysis used relatively small numbers, and thus the results could easily have been skewed for example by having mostly low risk cancers in the first two years and mostly high risk cancers in the last two years. The APC decline in mortality, which is based on much more data, is almost certainly the more accurate representation. In summary, what are realistic, socially relevant statistics on sarcomas? One in approximately every 350 people in the U.S. will be diagnosed with a sarcoma at sometime during their lifetime. One in approximately every 2,300 children under the age of 20 in the U.S. will be diagnosed with a sarcoma. Almost one-half of bone sarcomas and about one-fifth of soft tissue sarcomas are diagnosed in people under the age of 35. One out of three people, including children, diagnosed with sarcoma will not survive the cancer. For the period from 1975 to 1997, a time during which survival increased for many age groups and types of cancer, survival rates did not improve for adolescents and young adults with soft tissue sarcomas. Why care about statistics? Cancer researchers and advocates need a good understanding of incidence, survival, and trend statistics to be effective. But it is not always easy to find sarcoma data in SEER, because most adult cancers are categorized by site rather than histology. In this article, I have been using the "soft tissue cancers" and "bone cancers" as the closest category to sarcomas, but some of these cancers might not actually be sarcomas. Conversely, other categories of cancer include sarcomas that aren’t counted in these two categories. For example, about 3 percent of uterine cancers are sarcomas, but they are categorized under uterine cancers rather than soft tissue cancers. As there are about 39,000 women annually diagnosed with uterine cancer (SEER Cancer of the Corpus and Uterus data), this could mean an additional 1,170 sarcoma cases above those mentioned. SEER does provide data on histology of invasive breast cancers, and about 0.6 percent are sarcomas (SEER Table IV-22). The percentage is small, but because so many women are diagnosed annually with breast cancer, about 1070 would have sarcomas but not be counted among the soft tissue cancers. In addition, for some statistics Kaposi’s Sarcoma is analyzed separately from other soft tissue cancers, but for other statistics it is apparently included with other soft tissue cancers for analysis. SEER has in the past changed the classes of cancers analyzed. For example, in 1996 SEER began adding some statistical analyses for childhood cancers using the more standard ICCC classification system in addition to cancer site, and in 2002 SEER separated out mesothelioma for detailed statistical analysis. So I pose a question to all members of the sarcoma community: Should the sarcoma community request that SEER present statistics specifically for sarcomas, which for the most part they do not now do? Chapter 7, Soft Tissue Sarcomas, by Jacqueline Casillas, MD, MSHS, Julie Ross, PhD, Mary Louise Keohan, MD, Archie Bleyer, MD, Marcio Malogolowkin, MD. Chapter 8, Malignant Bone Tumors, by Leo Mascarenhas, MD, Stuart Siegel, MD, Logan Spector, PhD, Carola Arndt, MD, Dominic Femino, MD, Marcio Malogolowkin, MD. Ries LAG, Harkins D, Krapcho M, Mariotto A, Miller BA, Feuer EJ, Clegg L, Eisner MP, Horner MJ, Howlader N, Hayat M, Hankey BF, Edwards BK (eds). SEER Cancer Statistics Review, 1975-2003, National Cancer Institute. Bethesda, MD, http://seer.cancer.gov/csr/1975_2003/, based on November 2005 SEER data submission, posted to the SEER web site, 2006. Ries LAG, Young JL, Keel GE, Eisner MP, Lin YD, Horner M-J (editors). SEER Survival Monograph: Cancer Survival Among Adults: U.S. SEER Program, 1988-2001, Patient and Tumor Characteristics. National Cancer Institute, SEER Program, NIH Pub. No. 07-6215, Bethesda, MD, 2007. Chapter 11: Sarcomas, by Lynn A. Gloeckler Ries, Kevin C. Ward, and John L. Young, Jr.
U.S. Department of Health, National Institutes of Health, National Cancer Institute, Report of the Sarcoma Progress Review Group, A Roadmap for Sarcoma Research, January, 2004. V4N6 ESUN Copyright © 2007 Liddy Shriver Sarcoma Initiative.